OAKLAND, CALIF.--Even though the full Senate is debating the immigration reform bill S. 744, labor and community activists in northern California charge that the Immigration and Customs Enforcement (ICE) agency of the federal Department of Homeland Security continues to require local employers to fire hundreds of workers, saying they have no immigration papers. 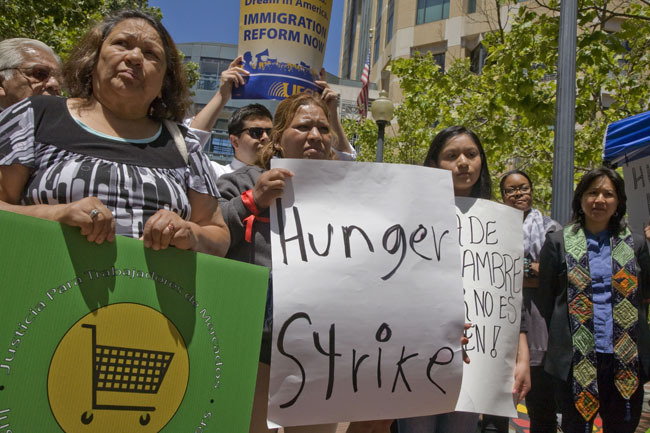 In protest, dozens of Bay Area immigrant workers and their supporters went without food last week in a 72-hour hunger strike to draw attention to hundreds of these firings. Fasters in Cesar Chavez Park in San Jose. The Obama administration, which strongly supports S. 744, calls the proposal “commonsense immigration reform.” The fasters charged, however, there is no common sense in firing workers while Congress debates the bill. The bill’s supporters tout the provisional legal status it would give some undocumented workers, like those currently being fired. But workers who are now losing their jobs in these workplace enforcement actions will not be rehired even if thebill passes, critics charge. Further, the job losses will push fired workers into poverty, below the income requirement that the bill imposes to qualify for legalization. Taking the hunger strike to Oakland's Federal Building. These firings are often called “silent raids.” Under the Bush and Clinton administrations, immigration agents dressed in black uniforms and carrying high powered weapons invaded factories and workplaces, rounding up undocumented workers in heavily publicized raids. The “silent raids,” in contrast, are not publicized at all. Instead of agents with guns, immigration agents force employers to fire workers. If people without papers can’t work, the rationale goes, they will simply leave the country or somehow disappear. Fasters sleep on the sidewalk. The firings, or “silent raids,” are intended to enforce a provision of the Immigration Reform and Control Act of 1986 called "employer sanctions." That act makes it illegal for an employer to hire a worker who has no legal immigration status, and makes it illegal for undocumented workers to have a job. In theory, this law penalizes the employer for hiring them (the “sanctions”), and penalizes workers by requiring the employer to fire them. In reality its effect is to make it illegal for an undocumented worker to work. Employers dependent on immigrant labor treat the possibility of violations and fines as a cost of doing business. Most employers receive no penalty, while thousand of workers lose their jobs and their families and communities suffer the hardships. Employers who cooperate in firing their own workers are given immunity by ICE, and escape any fines or punishment for violating the law. Since 1986, every job applicant in the U.S. must fill out an I-9 form declaring her or his immigration status. In an I-9 audit, ICE makes a detailed examination of those personnel records, especially Social Security numbers, and then gives the employer a list of workers it says are undocumented, ordering the employer to fire them. 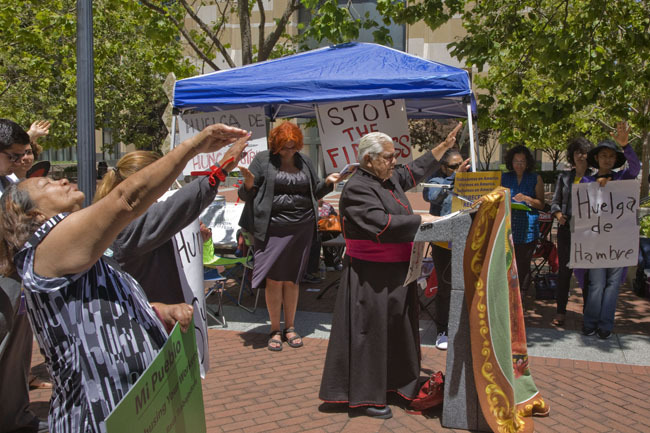 Monsignor Antonio Valdivia, a retired pastor in the Oakland diocese, calls on the government to stop the firings. In addition to protesting the ongoing firings, the fasters object to a provision in the new immigration bill. Currently, federal law specifies that only certain employers, such as some federal contractors, have to immediately report the information on the I-9 form of each potential hire to ICE for comparison with E-Verify, an enormous database of Social Security numbers, visa information and other personal data. (Any employer can be subject as well to the after-the-fact I-9 audits.) But Senate bill S. 744 would make E-Verify mandatory for all U.S. employers. That would turn the current wave of firings, which today encompasses thousands of workers, into a flood that could easily affect millions. The hunger strikers, therefore, had two demands. They demanded that ICE stop forcing employers to fire workers, whether or not the bill passes. And it called on Senators and Congress members to reject the inclusion of mandatory use of E-Verify in any immigration reform legislation. Fasters arrive at Mi Pueblo Market in Oakland. The Obama administration has increased immigration enforcement in the workplace drastically from the Bush and Clinton eras. 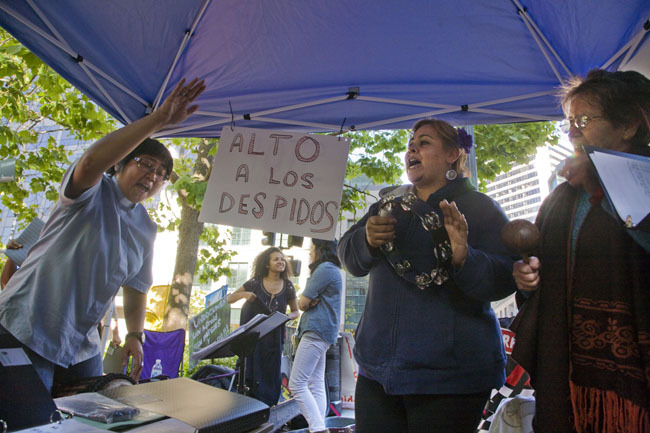 In the last two years alone, thousands of janitors have been fired in Minneapolis, Seattle and San Francisco, thousands of garment workers in Los Angeles, hundreds at Chipotle fast food restaurants and Target stores, and many many more. Among the many Bay Area firms where firings have taken place recently are Mi Pueblo Markets (hundreds fired), Pacific Steel (214 workers fired), Waste Management (three workers fired) and ABM (475 workers fired). In just the last few months, ICE has enforced the firing of 125 workers at the DoBake industrial bakery in Oakland, and over 200 at Joseph Albanese Construction in Santa Clara. Another faster, Gerardo Dominguez, organizing director of Local 5 of the United Food and Commercial Workers, calls the firings “an economic disaster for the Bay Area. These workers pay taxes that support local schools and services. Being terminated because of immigration status is a violation of their human and civil rights. Their families and our entire community will be harmed, and inequality and poverty will increase.” The fasters asked local elected officials to intervene with Homeland Security Secretary Janet Napolitano, and ask her to halt the actions. A worker from the DoBake industrial bakery describes being fired as fasters prepare to end the hunger strike. Because the firings are taking place throughout the Bay Area, the fast moved to different symbolic locations. 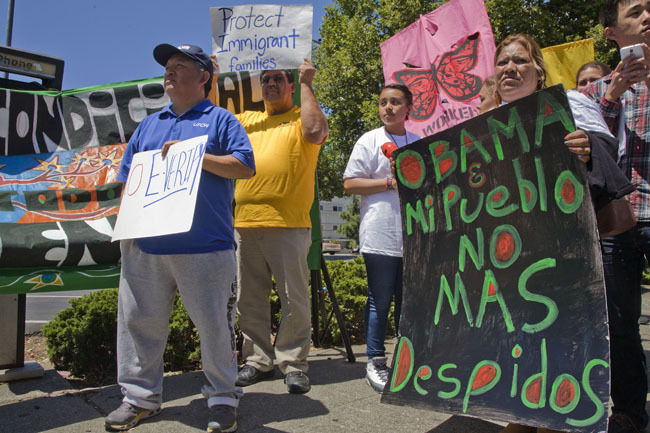 It began with a rally in Cesar Chavez Park in the heart of downtown San Jose. The south bay was a focus because of the recent audit and firing of workers at Albanese Construction, headquartered in Silicon Valley. The firm is one of the Bay Area's largest construction companies, and its employees are all union members. At San Jose's Federal Building. Richard Konda, executive director of the Asian Law Alliance in San Jose, called on ICE “to exercise commonsense judgment now and stop their enforcement that has resulted in hundreds of workers being fired. It makes no sense for these workers to lose their jobs now, with immigration reform on the horizon.” Konda called on Congress “to repeal employers sanctions that were part of IRCA, abolish the I-9 form and end any and all E-Verify programs. Employers should not be junior immigration inspectors,” he said. 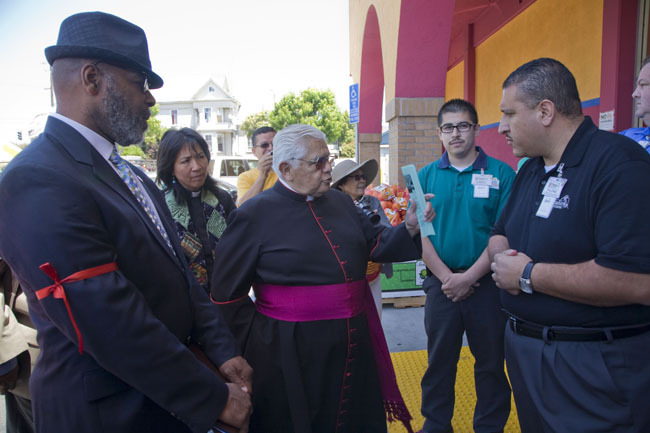 Monsignor Antonio Valdivia and other faith leaders ask the manager of Mi Pueblo Market to stop the firings. 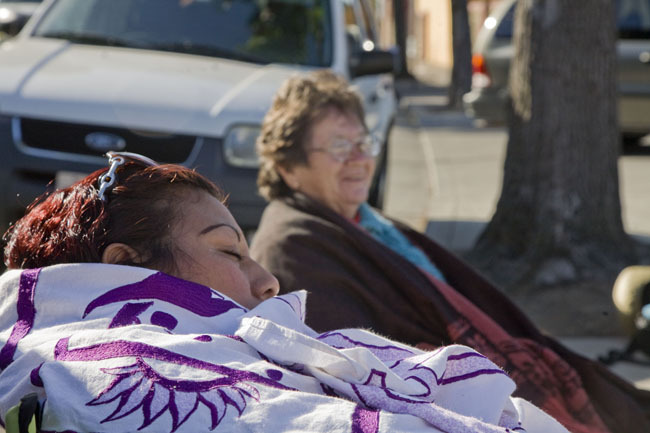 The following day fasters moved to east Oakland, where they set up tents on the sidewalk surrounding the parking lot of the largest store in the Mi Pueblo supermarket chain. A year ago unions and community organizations protested the use of the E-Verify immigration screening system by the Mexican markets, and accused the owner of using immigration enforcement to terrorize workers during their effort to organize a union in the stores. Workers have been trying to join Local 5 of the United Food and Commercial Workers Union for the past two years, in a bitter campaign. This April, Mi Pueblo confirmed that it was being audited by ICE and would have to fire an undisclosed number of employees. Some community and labor activists estimate that, given the chain's many markets, the firings could encompass hundreds of workers. As fasters gathered in front of the store, a group of religious leaders met with the manager to demand that the firings stop, and that the company respect the rights of its workers. They were not given any answer. Then fasters marched through the parking lot behind the Liberation Brass Orchestra, and were later joined by an Aztec dance troupe. 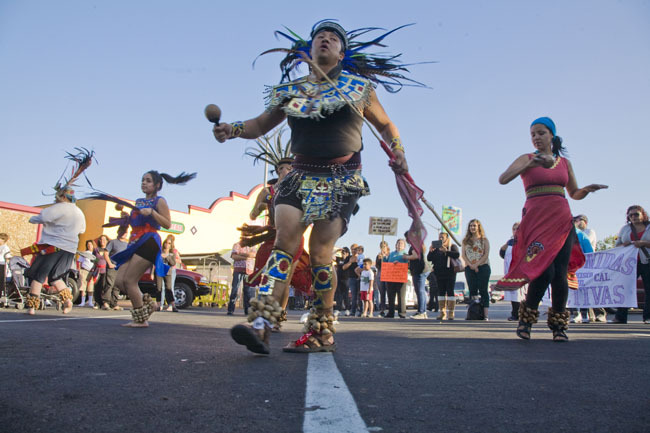 Aztec dancers in the Mi Pueblo Market parking lot. 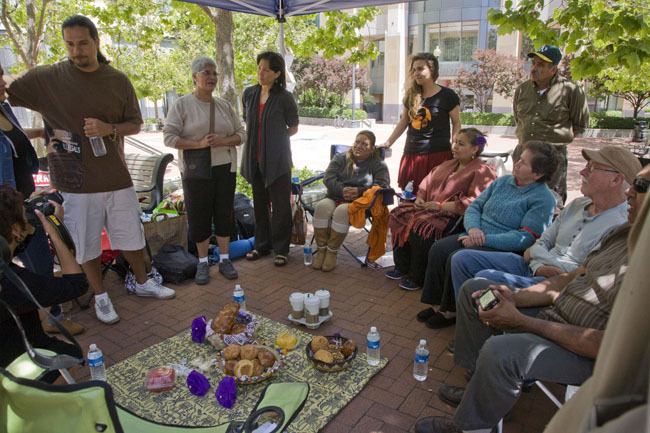 The last day of the fast was held in front of the Oakland Federal Building, with the support of both the South Bay and Alameda Labor Councils and many local unions. Representatives of Congresswoman Barbara Lee and Congressman Eric Swalwell both declared their support of the hunger strike's objectives. As the hungry participants shared loaves of bread to break their fast, they acknowledged that a long fight would be needed to get the government to end the firings, whether or not Congress passes an immigration reform bill. “But this is just the beginning,” predicted Fred Pecker, secretary treasurer of Local 6 of the International Longshore and Warehouse Union. 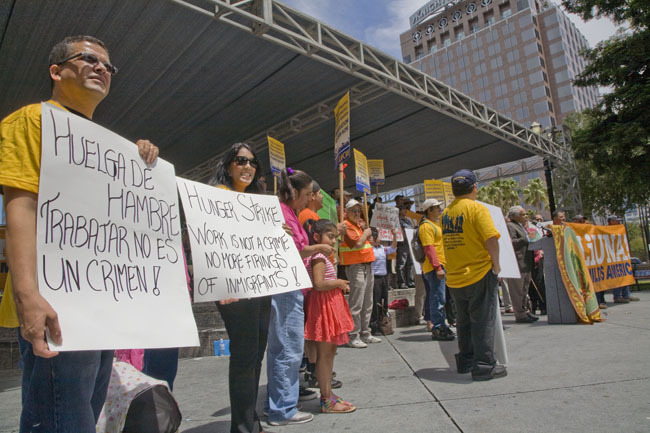 In April a similar fast was organized in San Diego to support workers fired in an audit at the Mission Valley Hilton Hotel. “We are extremely worried,” emphasized Rev. Deborah Lee of the Interfaith Coalition for Immigrant Rights. “Congress is pushing a reform bill poised to make matters worse,” she warned. “The bill will make the employment verification program, E-Verify, mandatory for all employers, and the firings we're seeing now will become much more widespread. Our elected representatives must tell ICE and Congress to end these firings and take the mandatory use of E-Verify out of the immigration bill. We must stop making it a crime to work in this country." Fasters sing as they get ready to spend the night in downtown Oakland. Public actions must go on! All our service for essay writing - http://www.grabmyessays.com/ support the protesters! I don't know what world you are living in but it sure ain't mine. i have mixed feelings about this but I support firing these people. As a guy who made his living working with his hands I've seen jobs that had semi decent pay,working conditions and safety lose all these things because of undocumented illegal workers. Most of these people are good folks and I understand that they just want to make a living and are exploited by greed heads.The top dogs need to go to prison.That is the only thing that will stop it. The only special skills that illegal immigrants have is depressing wages for all workers. Look how wages have fallen in the meat packing industry where production workers are mainly illegals who have been recruited and bused in from across the border by management seeking to pay employees as little as possible for extremely hazardous work. If you want to work in that kind of environment and pay structure, knock yourself out. Immigrant workers legal and illegal result in MORE jobs for everyone, including US citizens, by increasing production, which reduces prices, consumption, which increases demand, and economic diversity, which increases opportunity. If you need a job, move to a place with a lot immigrants, because they bring greater initiative, compassion, and entrepreneurial spirit that natives. Changing the topic doesn't change the facts. Illegals take away jobs from citizens and LEGAL aliens. Do you know what the latter are? Probably not. These are people who abide by the rules. They wait YEARS for a visa to enter the U.S. Then when they arrive, they wait more years to become naturalized citizens. So now with immigration "reform" the gate crashers will in effect get to cut in front of legal immigrants and also be allowed to become citizens. That obviously is very unfair. But people like you don't care about trivial matters like that. You're too falsely labeling others for pointing out that this so called "reform" is in reality a disgrace. The banksters think they are above the law. What kind of citizens do they make? Oh, that's right. The kind of citizens who stole the wealth of the middle class, foreclosed on millions of homeowners, and got bailed out with $29 trillion of corporate welfare from the Fed. Personally, I think we should kick out the banksters and all of Wall Street instead of UNDOCUMENTED immigrants. That would certainly get rid of the real harm being done to America. first of all this story shows how easy it is to enforce the illegal immigration laws. if this was done from 1986 we wouldn't have an illegal immigration problem. second it shows the mindset of the illegals, they actually believe they are above the law. what kind of citizens would they make? it was against the law to hire illegals in the first place. once they are found out does anyone really expect someone to keep illegal employees on the payroll and face jail and the fines? everyone knew it was against the law to work without the proper documents or employ someone without documents. caught without documents? all you get is a free ride back to the border. I don't understand what all the crying is about. everyone knew the game. they took their chance and got away with it until caught and the only consequence is a free ride home. there is no doubt that this many illegals is harmful to the country at the very least it depresses wages for Americans including and maybe more so for Hispanic-Americans.